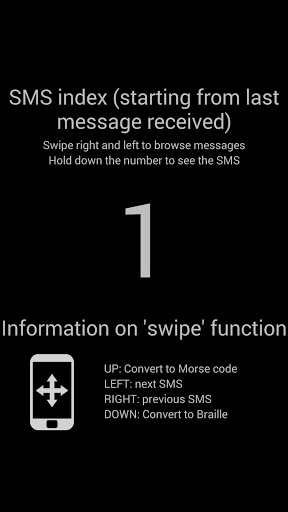 Blind SMS Reader is an application designed to make life easier for blind, partially sighted and/or deaf people by an advanced reading of Morse code. It also introduces a major innovation: reading Braille on touch screen devices. The app guarantees the privacy of the person as it communicates through the vibration of the device, and through a system of voice reading messages. 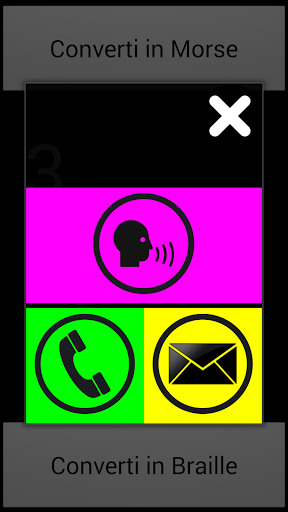 In version 3.0, Blind SMS Reader has introduced new features for partially sighted people such as the preview of the message, an option to choose the font size, voice reading, as well as a read-through in Morse code that allows you to follow the SMS highlighting the letters gradually converted, and allow to understand the message while keeping the device in your pocket (thanks to the vibration). But the news does not end there - on the main screen where you can read the SMS and move to the next or the previous message using the side keys usually used to regulate volume, there are two buttons to convert the text at once into Morse code or Braille. By pushing and holding the text of the message a window will open where you can choose if you want to reply to the selected message, call the sender or listen the SMS. The menu options have been enriched too! Now, as well as being able to set the font size as mentioned before, you can change the parameters related to the speed of the Morse code, e.g. the length of the vibration for dot, dash and spaces between letters and words, set the volume, the text in full screen, etc ..
You can switch easily between partially sighted mode to that for the blind and vice versa. 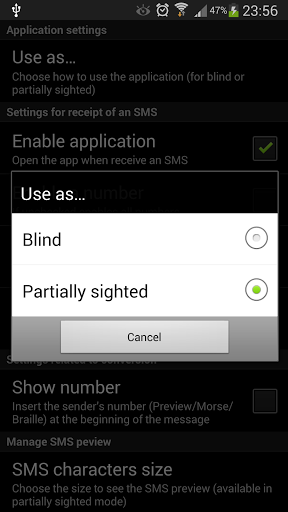 The mode for blind people is more simplified than the one just described: through simple gestures such as Swype or more conveniently using the side keys, (usually used to regulate volume) from the main screen you can select a text message to convert. Upon opening the app it will choose the last text message received, and read it in Morse code or in Braille. For Morse code conversion simply touch the screen to start the run and touch it again to stop. You can return to the main screen at any time by pressing "back" or performing a Swype down. 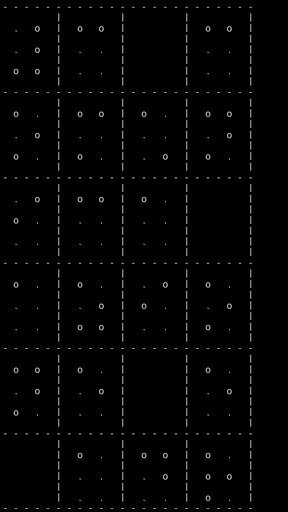 As for the conversion of text into Braille, what the user sees is a blank screen with the relevant letters converted. By passing a finger over the points where on paper it would be raised, a relatively long vibration is activated, while the empty spaces activate a shorter vibration. The spaces between letters and lines are identified by a continuous vibration. For space reasons the text converted into Braille is divided into browsable using the side keys usually used to regulate volume. Every transition from one page to another is confirmed by a brief intermittent vibration, while a longer, continuous vibration indicates the first or last page. You can return to the main screen by pressing "back" (two consecutive occasions) . The font size can be controlled from the settings menu on the main screen (it was intentionally omitted from the screen in Braille to avoid it being accidentally opened during the reading of the message). 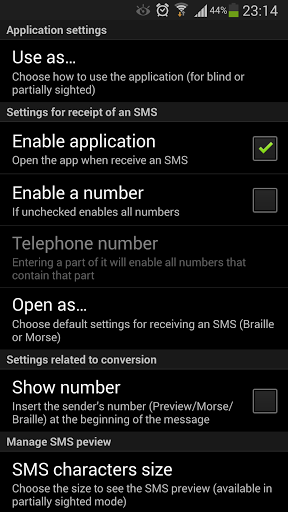 Needless to say you must, at least in the initial phase, have the support of an assistant to explain the operation of the app to the end user by setting the desired settings, amongst which the opening of the application upon receipt of an SMS by selecting as the default screen the Morse code or Braille settings. The size of the Braille characters are also adjustable. Feedback, tips and suggestions for improvements for the Blind SMS Reader are gladly received (for this reason I thank Brian Gubb and fair Handimatica 2014).